What is Immunisation? It is a way of protecting against serious diseases. Once we have been immunised, our bodies are better able to fight those diseases if we come into contact with them. How do vaccines work? Vaccines contain a small part of bacterium or virus that causes a disease, or tiny amounts of the chemicals that the bacterium produces. Vaccines work by causing the body's immune system to make antibodies (substances that fight off infection and disease). if your child comes into contact with the infection, the antibodies will recognise it and be ready to protect him or her. Because vaccines have been used so successfully in the UK, the diseases such as Diphtheria have almost disappeared from this country. There are some diseases that can kill children or cause lasting damage to their health. Immunisations are given to prepare your child's immune system to fight off those diseases if they come into contact with them. When should my baby be immunised? It is important that you baby has their immunisations at the right age - the first ones are given at two months old. They will be given further doses of these immunisations when they are three months old and four months old. 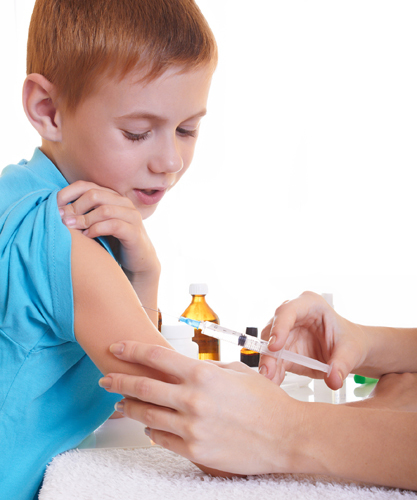 Other immunisations are given between twelve and eighteen months of age, then at three years and four months of age or soon after (before your child starts school); between the ages of twelve and eighteen years of age they will be offered further immunisations. How will know when my babys immunisations are due? Your doctor's surgery or clinic will send you an appointment for you to bring your baby for their immunisation. We run a special baby clinic every Thursday morning. All child immunisations are FREE of charge. REMEMBER IT IS NEVER TOO LATE TO HAVE YOUR CHILD IMMUNISED. EVEN IF YOUR CHILD HAS MISSED AN IMMUNISATION AND IS OLDER THAN THE RECOMMENDED AGES, TALK TO YOUR DOCTOR, NURSE OR HEALTH VISITOR TO ARRANGE FOR YOUR CHILD TO BE IMMUNISED.